M10 VACUUM BRAZED DIAMOND HOLE SAW is rated 5.0 out of 5 by 1. For exclusive use on 4 inch angle grinders. 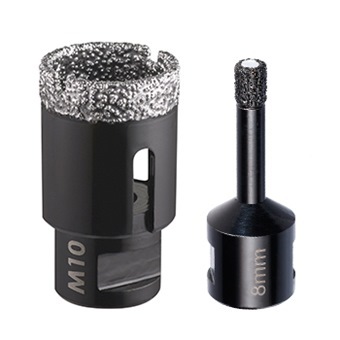 Each hole saw uses M10 x1.5mm female electric threaded-shank. Compatible to Bosch, Makita, Hitachi and other common power tool brands. Rated 5 out of 5 by Hakim70 from Perfect tool Just the right tool to repair perp joints and bed joints of a brickwall.